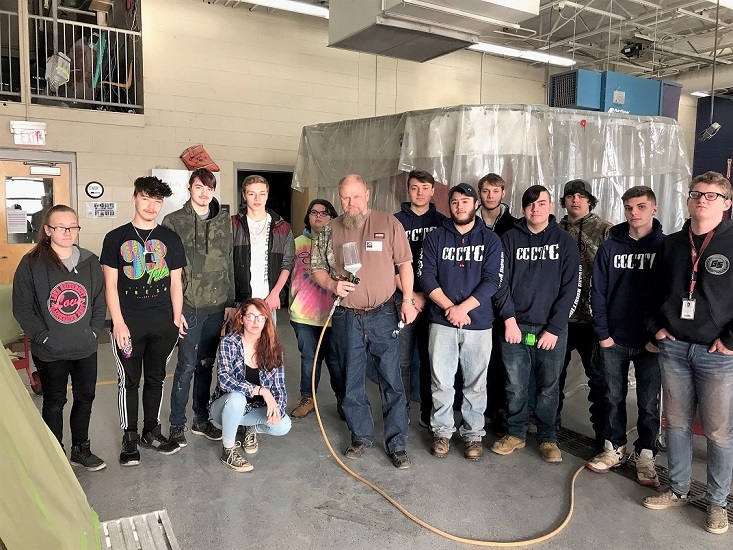 CLEARFIELD – Students in the Collision Repair program at The Clearfield County Career & Technology Center (CCCTC) recently earned their EPA 6H certification. The goal behind 6H is to reduce emissions of certain listed heavy metal hazardous air pollutants such as paints, primers and clear coats. There are many rules and requirements when it comes to the EPA 6H training. Fred Ison, a paint representative from Sata, trained students on the many requirements for certification. All students in the photo received their certification from the two-hour training, which is good for five years. This training makes graduating students more valuable to employers. Kneeling is JadeLea Zahniser of the Moshannon Valley High School. Standing, from left to right, are Haylee Pluebell (Clearfield Area Junior-Senior High School) Andrew Wandell (Clearfield Area Junior-Senior High School), Zach Shawver (Philipsburg-Osceola Area High School), Austin Holland (Clearfield Area Junior-Senior High School), Cassandra Verbeck (Moshannon Valley High School), Fred Ison (trainer), Ben Banghart (Clearfield Area Junior-Senior High School), Brycen Guthrie (Philipsburg-Osceola Area High School), Camron Brown (Curwensville Area High School), Robert Hullihen Jr. (Curwensville Area High School), Allen Ball Jr. (Moshannon Valley High School), Dalton Heichel (adult student) and James Wilsoncroft (adult student).